The French revelation of the Reggae Revival music Living melodies, conscious texts, authentic and passionate lions, this is the beginning of a journey to reggae revival. The Tuff Lions is a true family united around 8 musicians from different horizons, cultures and generations expressing their love for this music. The Tuff Lions is inspired by international reggae legends such as Israel Vibration, The Gladiators, Stephen Marley, Midnite, Rootz Underground and Chronixx that they had the honor to meet during different events. Their music is timeless, both soothing and dynamic, melodic and rhythmic, roots and modern. Traditional Nyabinghi percussions support committed compositions reflecting reality and imbued with spirituality of sharing, love and tolerance. "The message we express through our music is that with love and determination we can achieve everything." The Tuff Lions is somposed of young Jahvie (vocals, rhythm guitar), Jo D Léon (Bass), Tony Bongo (percussion), Filo (Keyboard), K Slash (Guitar) and Karigan Reggae Dummer. Laina and Eva (chorus) bring the harmonies to the melodies. They have the ardor of youth, experience of the stage, diversity and the will to move forward. Despite the pitfalls, The Tuff Lions is pleased with the success of his work. "We kept hope and persevered, it ended up paying. Jah Bless ". The EP 5 titles titled "Come to Fight" noticed in 2014 notably thanks to the promising clip of the eponymous track (Réal: Rec & Play media) was widely relayed by specialized media and social networks. From then on, the group began to emerge out of its beloved region of Toulouse and took routes farther and farther away. The release of "Vinyl 10" produced by Bam Salute Sound the following year allows them to reach more fans of Sound System, and to release a second clip “Still Alive”. The Tuff Lions has the will to share its conscious messages with the public and does not hesitate to travel the country and its surroundings to meet him. 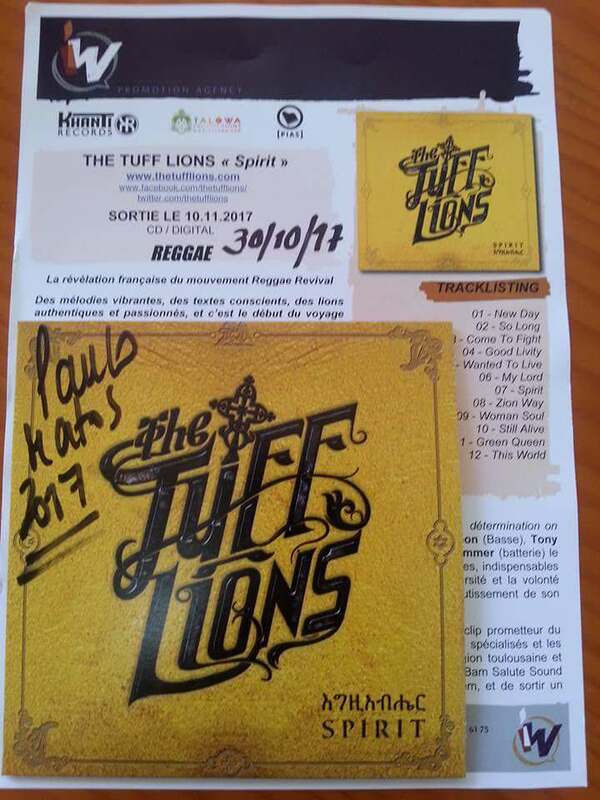 The Tuff Lions have had the opportunity to perform on various European festivals: Reggae Sun Ska, Minho Reggae Splash (es), Printemps de Bourges, FestiJam, Rastaf'entray, Africajarc. No matter the age, skin color or personal convictions, only the love of music triumphs and it is a pride to see their audience dancing with joy at their concerts. "The day after a concert in Var region, we helped the festival-goers of Africajarc (Lot) at the last minute, replacing headliner Winston McAnuff. Seven hours of transports with no breaks and technical challenges have not prevented us from igniting the scene beyond everyone's expectations. " This first official album "Spirit" is released after five years of sharing music with the public. The group has been sticking together all the time, reinvesting the revenues of the concerts directly into the production of this album, which makes Tuff Lions a proud group to be 100% self-produced. "Spirit" was recorded at Studio 809 (31) by HP Barnet assisted by Live I (Alkemy Prod) who recovered the recorded project to insert the musical cuts (Dub). Proud of the quality of the recordings, the group decided to move to Paris. It was at the Wise Studio in Ris Orangis (91) that the mix was made by the great Fab Wize (Taïro, Mo'Kalamity, Pierpoljak ..) and his team. The album acquires a quality sound and effects worthy of the great names of Reggae Music. Mastering was finalized by Simon Capony at Basalte Studio Mastering. "Spirit" was originally an outlet for authors, as Jo and Jahvie drew inspiration from their own lives by describing situations that were revolting, touching, or inspiring, but always crying out for truth. This very personal album also reflects the musical orientations of the musicians, each bringing their unique touch. Karigan notably brought its color Rub a Dub with its digital battery 80's on some titles. Jo plays the bass naturally world-music, Filo was able to embellish the album of sounds jazz and roots as its acolyte K Slash which proposes guitars sometimes slipped sometimes rock'n'roll and others. Tony Bongo has an omnipresent place on this album, using dozens of different percussions. The Nyabinghi were recorded in the tradition, all together (bass-drum, fundeh, akete). "A reggae tonic carrying the inhabited voice of the singer Jahvie, seduced the festival-goers”. RFI commented recently. For the national release of this album, The Tuff Lions began a collaboration with Khanti Records, a Toulouse label that has supported the group since its creation and has offered to go out in large distribution through its distributor PIAS. Xavier has been performing concert research to date and has been offered the services of Talowa Booking, thus delegating the necessary steps to professionals in the field. Rec and Play Media provides visuals and clips for the group since its creation. They are currently working on the production of three clips for the album "Spirit", the very first ”Green Queen” was unveiled in September on Youtube. The next clip is announced for 10.11.2017, the official release day of the album "Spirit"..
“So Long”, “My Lord” and “Still Alive” are my favourites in the Album !